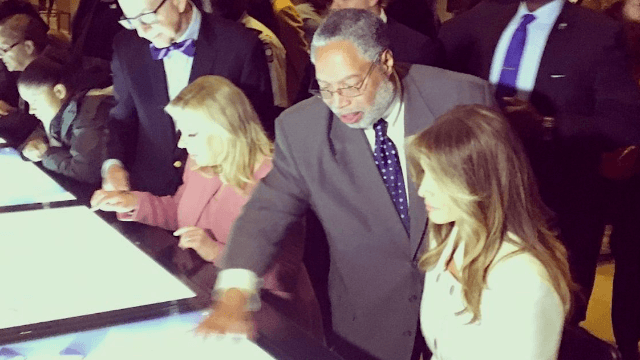 Melania Trump got accidentally photobombed and tweeted out the pic anyway. Melania Trump is having a rough week on Twitter. Luckily for her, she seems completely unaware of it. First she started the #PowerOfTheFirstLady hashtag and got massively trolled, but kept tweeting the hashtag. "It was an honor to visit the Smithsonian National Museum of African American History," she wrote. As Cosmo pointed out, his positioning close to Melania suggests he's probably Secret Service, which would make this (probably accidental?) photobomb even funnier. getting rid of the ACA disproportionately disadvantages black women- do something for your people. Don't just take pics in museums. You see any tax returns lying around? In Melania's defense, she hardly ever sees him! Someone should probably teach the First Lady about Twitter. On second thought, don't do that. Melania #TwitterFails give us too much joy in these dark times.